Trustees of the Small Enterprises Research and Development Foundation (SERDEF) participated in a forum on contemporary fundraising strategies organized by the Association of Foundations (AF). 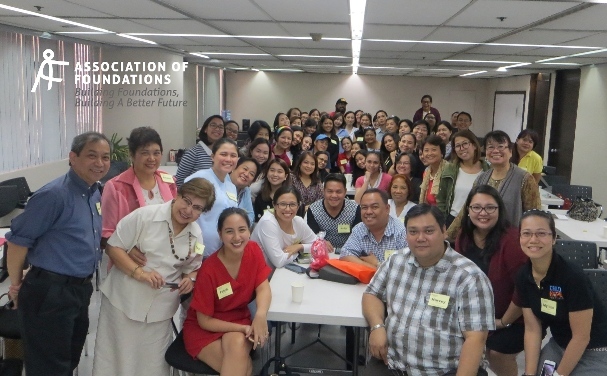 Titled “Fundraising 2.0: Resource mobilization using online platforms,” the forum held on October 3 at the AF office in Quezon City drew 55 participants from 35 organizations, including SERDEF Trustees Paz Diaz, Serenidad Lavador, and Arlene Liberal. Fifty-five participants from 35 organizations participated in the fundraising forum organized by the Association of Foundations. Childhope Asia shared their experiences in using online platforms to generate funds and support for their cause to uplift the lives of street children. Simply Giving, Global Giving, Silicon Valley Community Foundation, Gava Gives, Pass It Forward, and Your Cause are among these platforms. They also gave the following reminders to participants: 1) Make sure that legal documents, such as registrations, certificates are updated and ready to share with the online platforms; 2) Learn how to assess which platform might be right for the organization and its needs; 3) Understand and manage the potential risks when taking online payments; and 4) Send “Thank You” notes/letters right away to online donors.